Veneers are ultra-thin, tooth-colored, custom-made shells that are bonded to the front of your teeth to improve their appearance. Veneers are made from porcelain or composite resin material to match the normal shade of your teeth. Veneers can cover discolorations or stains, fill gaps between front teeth, and cover teeth that are worn down, chipped, broken, misaligned, uneven, or irregularly shaped. Porcelain veneers normally resist stains better than resin, and usually reflect light more like normal teeth. However, resin veneers are thinner than porcelain and do not need as much removal of the tooth surface as porcelain veneers do. Veneers are a more conservative choice than crowns when it comes to changing a tooth's color, size or shape. With veneers your natural teeth remain mostly intact, while crowns require more of the tooth to be removed in order to fit. Porcelain Veneers Are the Best Solution! 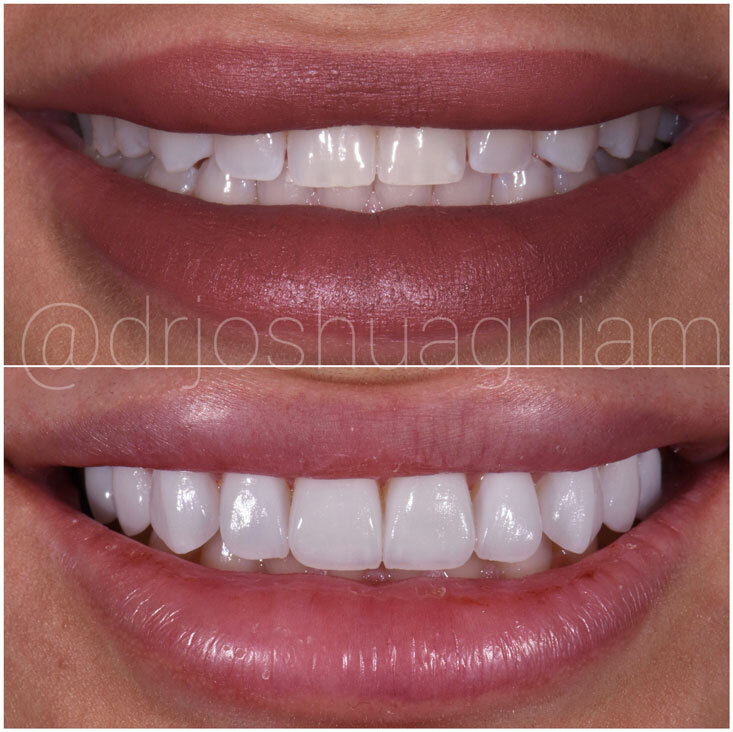 One of the most amazing benefits of porcelain veneers are there versatility in correcting many imperfections that exist within our teeth. Dr. Ghiam of L.A. 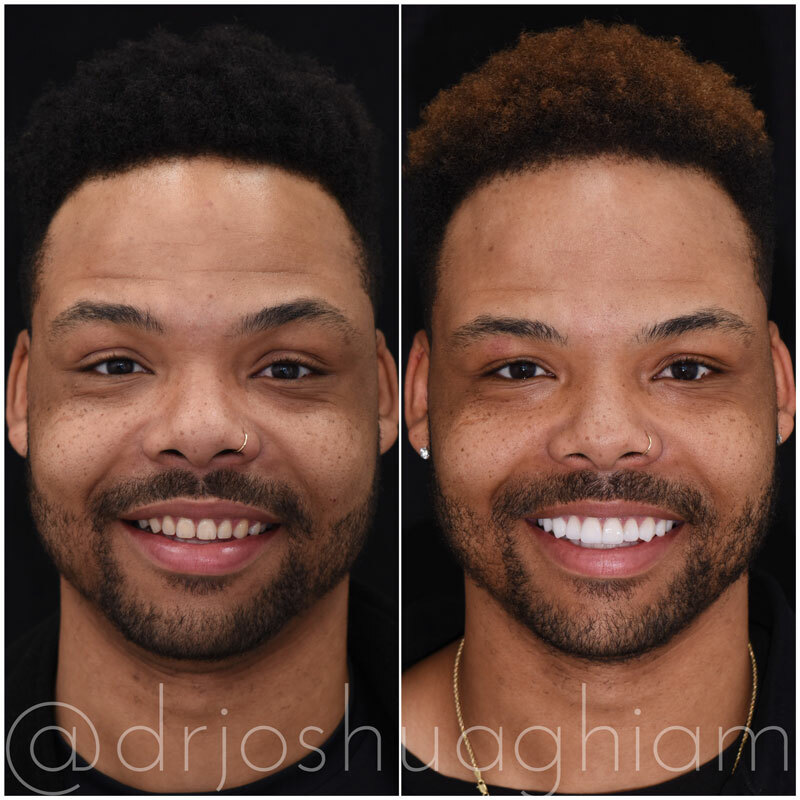 Smiles Dental Spa has mastered the art of applying porcelain veneers to dramatically improve the aesthetics of your smile. Crooked teeth – many of us are never satisfied with crooked teeth. Thankfully to advanced, modern dentistry you no longer have to endure orthodontics typically lasting for 1-2 years until you see results. 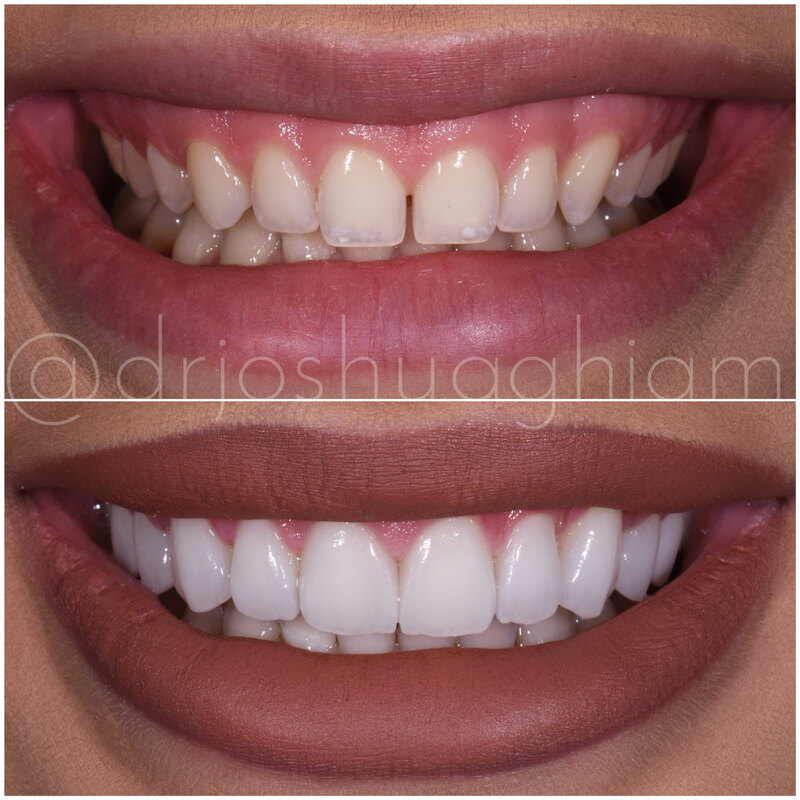 Simply have Dr. Ghiam apply a set of porcelain veneers in as little as 2-3 appointments. I've been embarrassed to smile for years and now I get compliments all the time, from strangers even that I have "pretty teeth". He made my teeth look natural too, like they were supposed to from the beginning. Gapped teeth – similarly to crooked teeth, gapped teeth often bother many individuals. 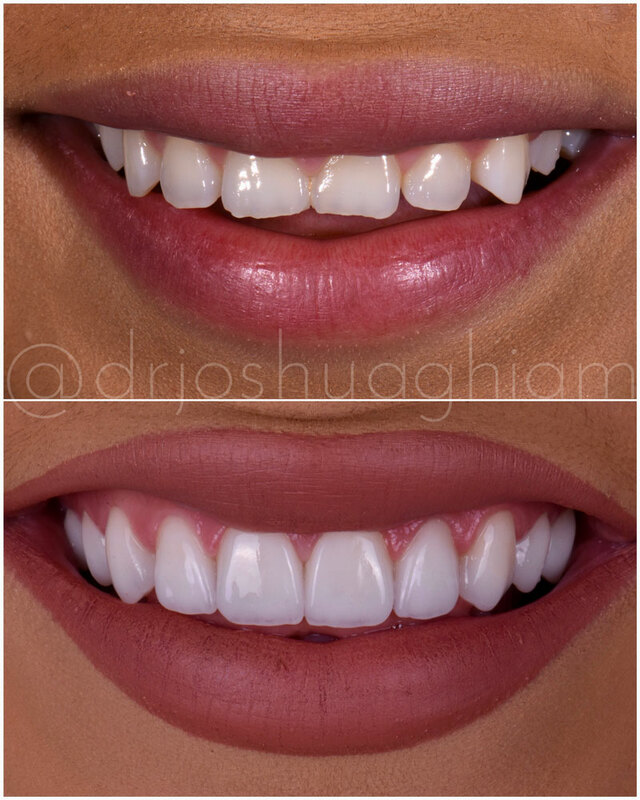 If you find yourself unhappy or displeased with gapped teeth, then Dr. Ghiam strongly recommends a set of nice, porcelain veneers to fill in the gap. You’ll be amazed at how easy & simple the entire process is! 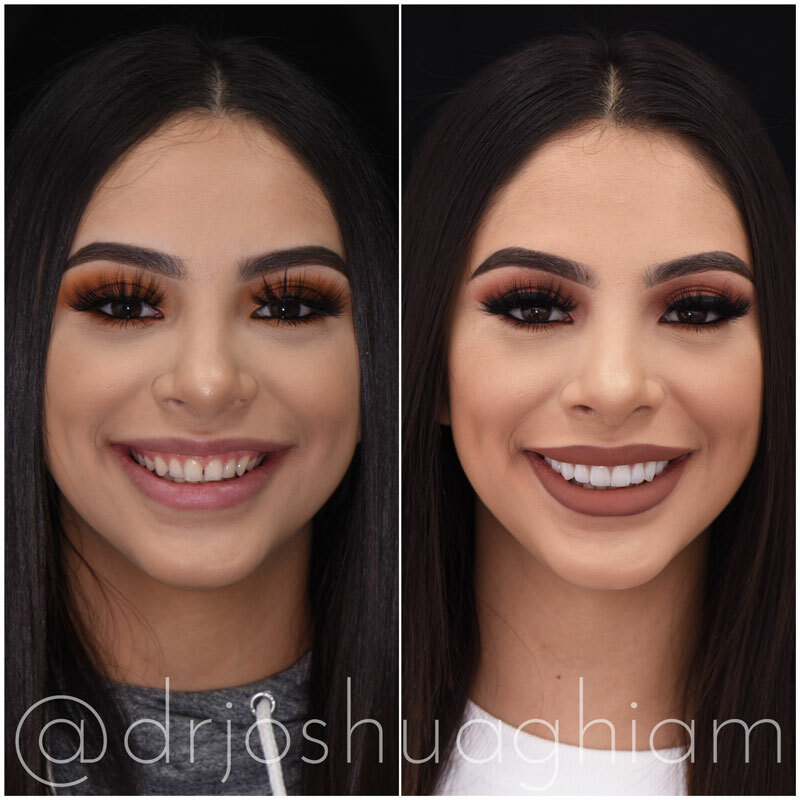 Uneven teeth – if you have teeth that are too small in proportion to your other teeth leaving you with an uneven balance, then veneers are a great quick solution. By applying a veneer to the teeth, the uneven balance that exist in your smile is able to be restored. Teeth that have been grinded – Some of us have a habit of grinding our teeth. And some of us may not even realize it as it may take place when you’re sleeping at night. In any case, if you have teeth that appear worn down from grinding, veneers are a relatively easy quick fix. Just ask Dr. Ghiam! You may also be recommended for a custom mouth guard. 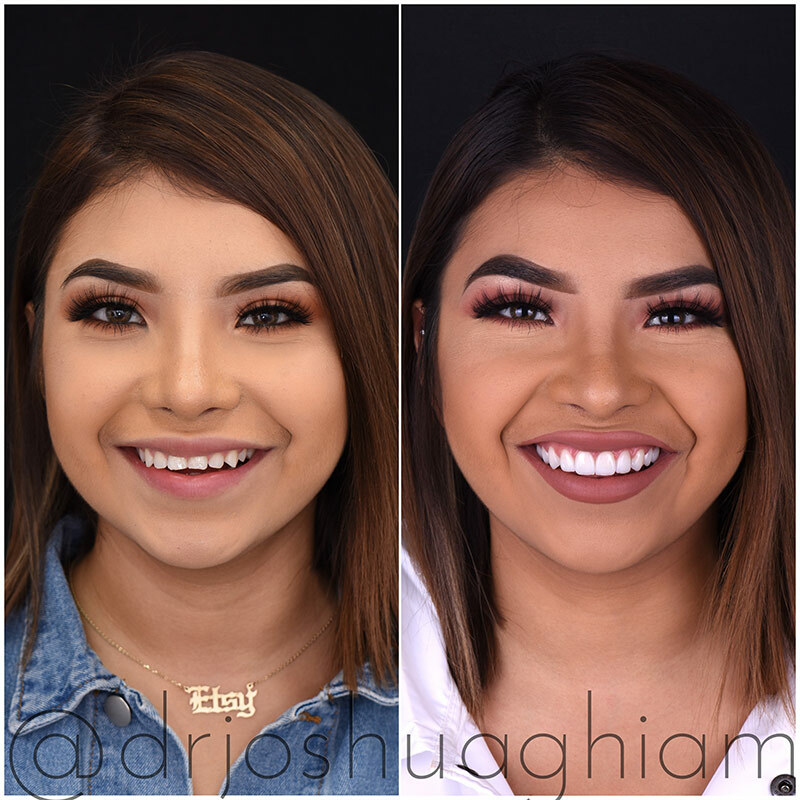 Stained, discolored teeth – there are many ways of tackling stained, discolored teeth that appear yellowish and veneers happen to be one of those solutions. Teeth whitening works very well, but must be performed every year or so to maintain results. Veneers, however, are a permanent solution to stained teeth. To see if you’re a candidate for veneers, our dentist will use a high-tech diagnostic tool (cosmetic imaging) that allows you to see what it would look like to have veneers. X-rays may be taken of your teeth to give us a better look. You should ask our dentist any questions you may have. We want our patients to be a part of their smile design. Once the correct type of veneer has been chosen, our dentist will prepare your tooth by gently buffing it. Then our dentist sculpts the composite resin veneer onto your teeth. If you’re getting a porcelain veneer, a mold will be taken of your tooth and will be sent to a lab, which will create the veneer. After your tooth is cleaned with a special chemical, our dentist uses cement to carefully bond (attach) the veneer to your tooth permanently. Our dentist will then use a light beam to harden the cement on your tooth. The whole process is usually painless, but you can still receive a local painkiller before the treatment begins. After you get your veneer, it may take about a week or two to get used to it. While your veneer may feel different, you will soon get used to wearing veneers. After one or two weeks, you till return to our office for a follow-up visit with our dentist to make sure your veneers are in good shape. A veneer can greatly improve your smile and self-esteem, and restore your natural tooth’s function. 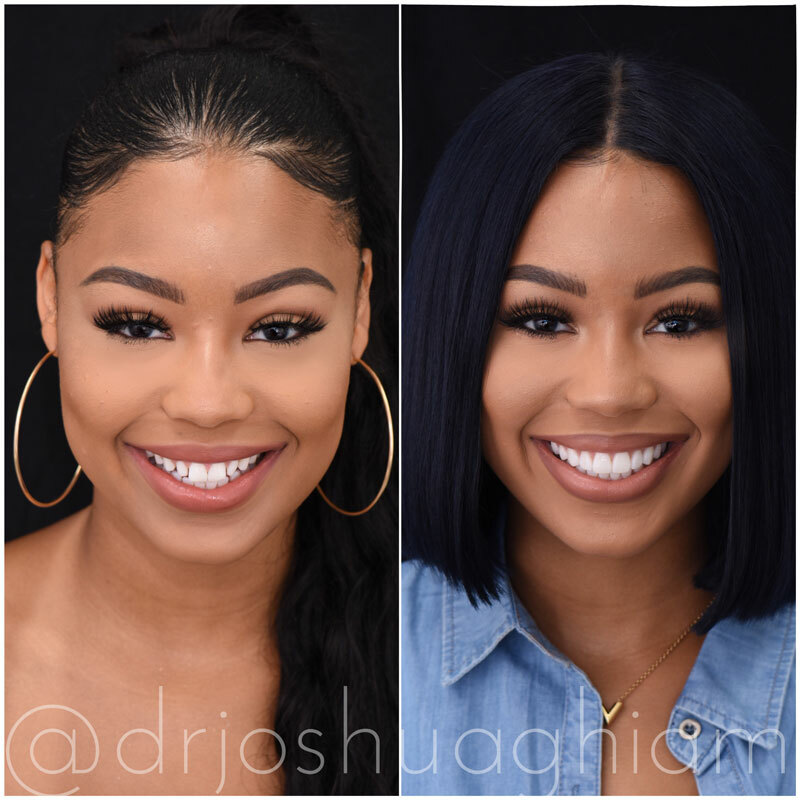 Because veneers are individually sculpted for each person, it is almost impossible to see the difference between a veneer and your natural tooth. 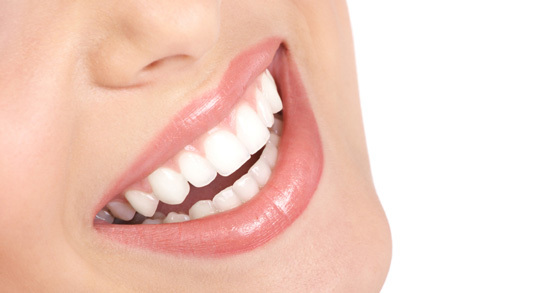 Learn more about the cost of dental veneers in Los Angeles. If you’d like to learn more about veneers, please call (323) 651-0933 and make an appointment with our experienced dentist.